Dixons Travel is the UK's leading airport technology store, showcasing a host of gadgets such as Apple products, tablets, headphones and cameras, mobile phones and smart devices. Why shop at Dixons Travel? Easy returns - if you change your mind, that’s not a problem. You can return your product unopened, in its original and undamaged packaging, within 21 days to any Currys or PC World store in the UK and we’ll give you an exchange or full refund, provided you have your receipt. Internet beating prices - Dixons Travel promises to beat the websites of Amazon, John Lewis and Argos (third-party sellers excluded). 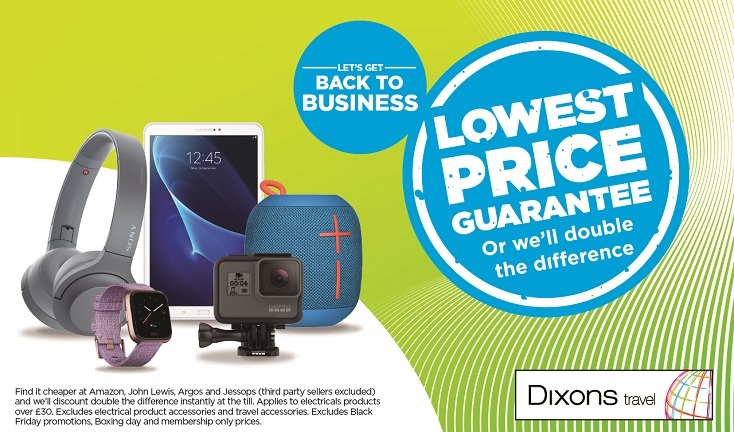 If you find any Apple products, tablets, laptops, cameras, mobile phones or premium headphones cheaper, Dixons Travel will discount double the difference.